One thing I've been wondering about STOP Thurston County, a local franchise of the Evergreen Freedom Foundation, is why they've focused with such laser intensity on particular environmental rules. I'd assume that if these rules were up for a county wide vote, they'd pass. I mean, across the entire county, Thurston County is pretty liberal. And, the reason isn't necessarily that Thurston is liberal to the core. It literally matters how you carve up the county. 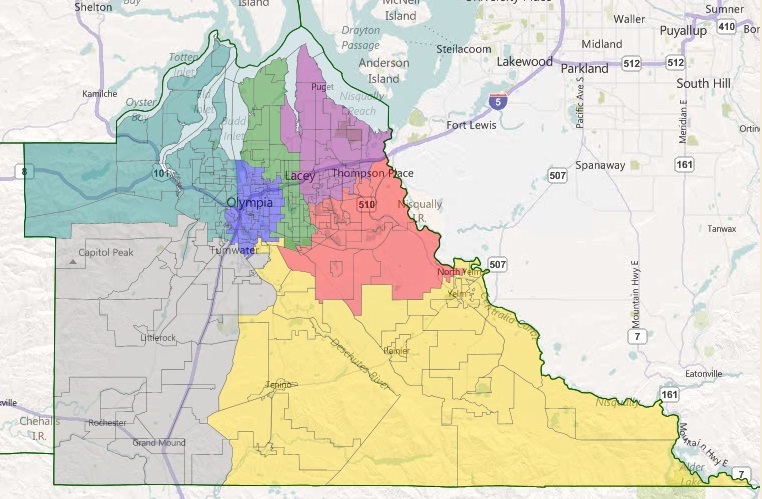 If Thurston County were to pass a home rule charter and create more elective districts, you could see how the balance of power in the county could change. 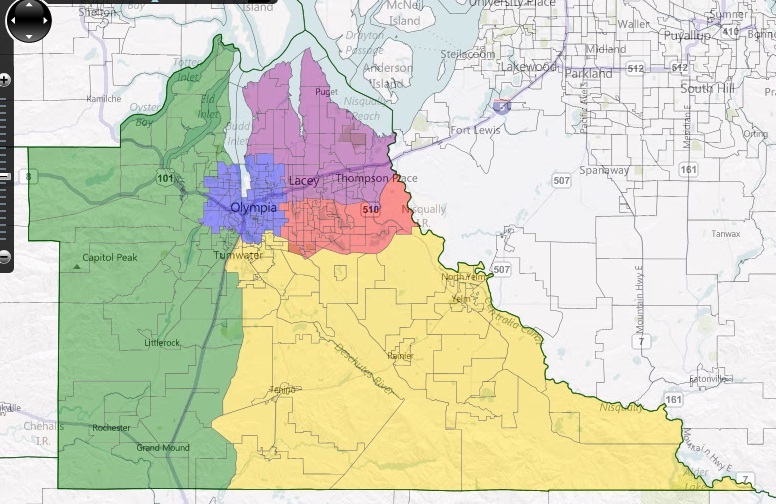 Currently, all three seats on the Thurston County commission are held by Democrats. And they were elected by an average vote percentage of 56 percent. So, the geographically small urban district is still largely Democratic, but every single other district is balanced. If Republicans did everything right, you could easily see a 4-1 advantage on a county council. So, in this option, you have three strong Democratic districts and then four which are balanced, with an equal number of those leaning Democratic or Republican. So, in a "Republicans do everything right" scenario, you could have a 4-3 advantage on a county council. On the other hand, in a Democrats do everything right, you have a 6-1 or 7-0 advantage. 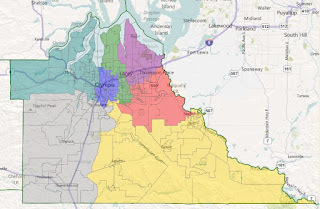 I will admit to trying to game the map by a little by keeping Olympia as whole as possible, thereby not spreading Democratic influence across the northern districts. But, I was just trying to illustrate how home rule would spread influence. You can download the .drf files I linked to under the maps to change my assumptions. Either way, both scenarios show how creating more representation on the county level (more than our three current commissioners), you dilute the Democratic influence across the county. If STOP Thurston (arguably the most vibrant county level conservative movement in a decade) worked on governance issues, they could change the rules to make it more likely they could change the rules. Yeah, duh. That's what I meant when I said they were the local franchise.